Omer Dekeyzer from Oudenaarde was for many years invicible in the area of Oudenaarede and Kortrijk. Two of his greatest cracks were the ‘Droom’ (‘Rève’) 595308/45 and his son the ‘Pommelé’ (4207842/47), who came out of the ‘Droom’ x his own daughter the ‘Mosaique’. Jacques Tournier bought the ‘Droom’ when he had already won half a million francs in first prizes from Cambrai to Chateauroux. At that moment the ‘Droom’ might well have been the best pigeon of Belgium. The acquisiton had not been made easy, because at the sale of De Keyzer the ‘Droom’ and his son ‘De Pommelé’ were displayed with the mention ‘are not for sale’. De Keyzer wanted them to die of old age in their own loft! But Jacques persisted and finally he succeeded to buy the ‘Droom’ privately. Because the ‘Droom’ was by now infertile, Jacques was allowed to exchange him for the other champion ‘De Pommelé’, the son of the ‘Droom’. Paired with a sister of the ‘Zolder’ they produced among others ”t Meeuwke 421′. And out of her daughter was born ”t Goed Wit 216′ (5001216/63), that made its name with among others 2nd national Angouleme. With the arrival of the ‘Pommelé’ the ‘ooievaars’ or ‘grizzles’ entered the Tournier family. And as so often before this transfer also turned into an enormous success. Especially through the ‘Goed Wit 216’ numerous superior ‘grizzles’ were dispersed all over the world. The ‘grijze’ Tournier pigeons brought great success for the late Arie van den Hoek, and because he introduced these ‘grijze’ pigeons again into Belgium, they are called the ‘grijze van den Hoeken’ there. 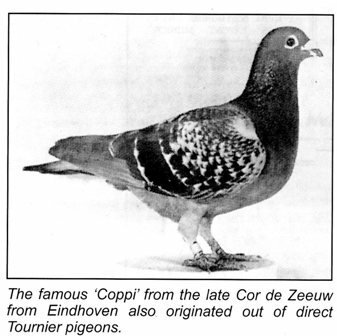 But we may never forget that the family of van den Hoek was for 95 per cent composed of Tournier pigeons, and that for instance the legendary stock couple ‘Othello’ x ‘Nel’ were two DIRECT TOURNIER PIGEONS! The late Pastor Gillessen of the Dutch Simpleveld was one of the first car-winners with a ‘Vosje’ Tournier. 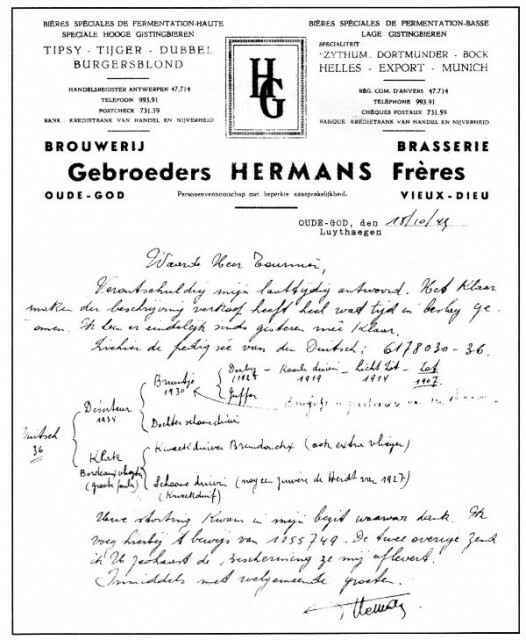 In the above shown letter of 18th October 1949 the legendary brewer Jos Hermans from Luythagen (Oude – God) records the pedigree of the famous ‘Duitsch van 36’ (related to the ‘Boot’), from whom Tournier posessed several descendants. And although Jacques Tournier almost never risked his best pigeons in this Pyrenee classic, the ‘Schalie Barcelona’ almost added the name Tournier to this most famous of pigeon classics. As it was, the ‘Schalie Barcelona’, after having lost several minutes, finished 2nd NATIONAL AGAINST 3,756 pigeons and also 2nd INTERNATIONAL. She was only just behind a two-year ‘cracker’ from Gilbert Vandeweghe from Olsene. The renowned beer-brewers, the brothers Danhaive van Basècles, did have the first reported with half a ‘Delbar’ but this pigeon was, because of the overflight, beaten with ample difference. A few years later the result was 7th INTERNATIONAL BARCELONA. And where the first time had been shear bad luck that cost the 1st International, this time is was due to a mistake. The fact was that the pigeon was earlier then the fancier! It was notable that both pigeons had a lot of René Maes’ blood in them. Two pigeons that were real cracks in the speed races and that could have gone much further, in view of their ancestry. The ‘Zolder’ had mainly the blood of the ‘Kleine Blauwe Maes’ and the ‘Tist’ in him. The ‘Goede Kleine’ was a combination of Maes x Witkop line from Liekens. The ‘Zolder’ won numerous 1st prizes in speed races and would undoubtedly have won even more had he not invariably flown around for 1 or 2 minutes before coming in. It was also notable that the ‘Zolder’, with head wind as well, still flew very high upon arrival. And if ever a Tournier pigeon has proved the rule of Jacques that ”pigeons able to fly speed must be able to fly long-distance too’ was right, it was the ‘Zolder’. 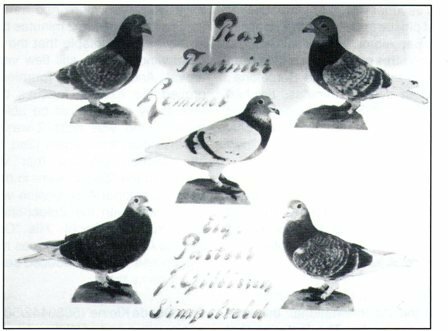 No less than three times (2nd, 7th and 11th international) pigeons that were closely related to the ‘Zolder’ were in the lead group from Barcelona! A champion who had a lot of success with the Zolder-line was Johan Booi from Dordrecht. His ‘Oude Blauwe’ went to America when he was already an old pigeon and he still produced several sublime decendants there. The ‘Goede Kleine’ (5080442/58) was of Maes origin with a part of Witkop from Liekens. For many years he was almost unbeatable and he too won dozens (!) of 1st prizes. In the breeding loft the ‘Goede Kleine’ became one of the best breeders of all time. Dries Hagers from Berkel (Holland) won the race from Dax with a descendant and Frans Derks from Geldrop (then still Derks-Weekers) had a real goldmine with his ‘Oude Kleine’ (B68/5226351). This super breeder produced several 1st prize winners in the champions loft in Geldrop. And not only there, but with many others too. The best known was grandmaster Jos van Limpt, nicknamed ‘De Klak’ from Reusel (Holland). This ‘champion since 50 years’ was known as the strongest Janssen branch loft in the world. One day he got a squeaker as a present from his friend Frans Derks. And because this young pigeon came from one of his best friends, Jos could hardly decline. Therefore he put it in the racing loft and there this Tournier youngster (ring number NL70-89) grew up to be a real champion and obtained the nickname ‘De Frans’. And although we don’t see much more of this line with Jos Klak himself, the famous ‘Blauwe 59’ from the late Harrie v.d. Mierden from Steensel (Holland) was a grandson of ‘De Frans’! And a true brother of the famous ’59’ is nowadays the golden breeder of the family Schroevers from Arnemuiden, ex middle-distance champions of the Netherlands, Gouden Duif winners and so on. The breeding qualities of the ‘Goede Kleine’ didn’t go un-noticed at the Lepelstraat in Lommel. Until a very old age he produced many ‘extra’s’, especially coupled to the fantastic breeding hen ‘Blauw 317’ (5030317/64). 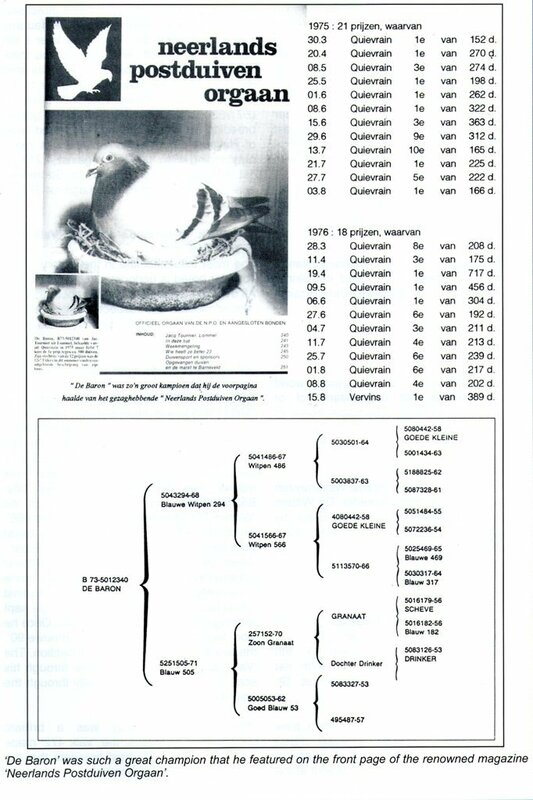 With this wonder hen, also the mother of the ‘Witpenneke 466’ (5113466/66), himself the father of the crack ‘Blauwe 312’ (5047312/69) from Jaak junior, he produced among others the ‘Goede Donkere 315’ (5043315/68), a super champion and himself the father of the ‘Spikkel 51’ (5012051/73), the wonder racer on all distances with among others 1st Dourdan, 1st Bourges and 1st Brive (2nd provincial). The stock pigeon of the famous champions loft Piet v.d. Merwe from Dordrecht (Holland), ‘de 917’, was a grandson of the ‘Goede Donkere 315’. The ‘Spikkel 51’ also had numerous sublime champions as descendants in his own loft and elsewhere. For instance: the famous ‘Jarnac-duivin’ (5005221/85), that won 1st semi-national Jarnac (740 km) against 3,801 pigeons, comes out of the line of the ‘Spikkel 51’. As does the ‘Montargis’ (5010524/90), that won 1st Montargis (403 km) Groot Gewestelijk against 1,337 pigeons. Another grandson of the ‘Goede Kleine’ that made a name for himself was the ‘Spikkel 417’ (5041417/67). He produced among others the wonder breeder ‘Kleine Geschelpte 469’ (5012469/73), father of among others ‘Goede Geschelpte 729’ (5090729/76), that for Hub Hendrix from Weert (Holland) won races like 1st Bourges 1,534 pigeons and 3rd Argenton 1,364 pigeons and became 1st Champion Pigeon Union Weert. He also produced the ‘Goede Lichte 725’ (5020725/78), that won seven 1st prizes and also won 2nd Interprovincial Chateauroux against 2,823 p., and the ‘Boeing 707’ (5090707/76), that won several 1st prizes and among others came 22nd semi-national Chateauroux against 9,616 p. In the seventies the ‘Spikkel 417’ also made through his descendants, Ton van Mechelen from Huizen (Holland) almost unbeatable and through him Cees de Waal from Dordrecht had much success too. And grandmaster Dries Hagers won the 1st national Dax with a descendant from the ‘Goede Kleine’ line. With ‘De Baron’ history repeated itself. Because just as his forefathers, the ‘Goede Kleine’ and the ‘Kleine Blauwe Maes’, ‘De Baron’ was an exceptional champion in speed races. I often witnessed him winning yet another competition. And he often flew minutes ahead, especially with real ‘pigeon weather’, when the sun stood high in the sky and there was a tail wind. What a pity for the ‘Voske 100’, his loft mate, because without the competition of ‘De Baron’, the ‘Voske 100’ would often have finished first. I was very much impressed with the performances of ‘De Baron’. He proved to me that there really are pigeons in the world that can achieve much more than others. And ‘De Baron’ could!. During the seasons of 1975 and 1976 he won 38 prizes without doubles, among which 11 pure firsts and 24x among the first 10. Notable too was that he regularly flew 3 to 4 minutes ahead. And after the second pigeon had returned, the rest followed in short succession and the race was over very soon. ‘De Baron’ was of an almost unworldly quality. And to think that I was partly responsible for his existance. That came about as follows: in Meijel, at the sale of spring youngsters from Tournier in March 1972, I bought a small ‘dark blue pied’ squeaker with the ring number B72/5016103. I could just about afford this youngster because she didn’t look much for her 20 days. This youngster now, grew into a real crack in the loft of my late father-in-law, Janus van Oorschot. 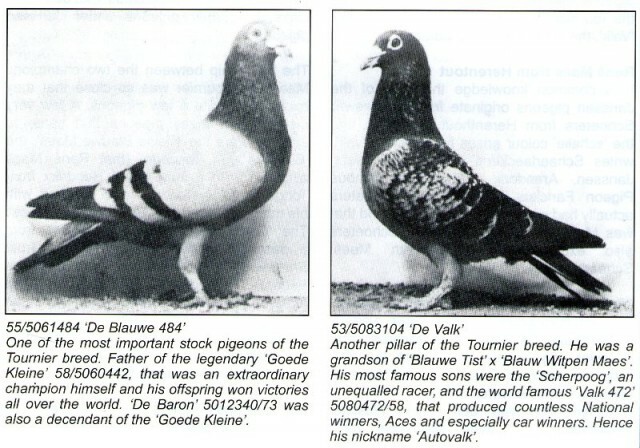 As a youngster it already won a multiple of its purchase price and became mother of the ‘Blauw 59’, that among others won a 1st with a head wind against thousands of pigeons. What has that to do with the birth of ‘De Baron’?.. I will explain. During those years my mentor Tournier and I wrote to each other at least once a week. And after the purchase of the mentioned squeaker I wrote to him, that it made a ‘bright impression’, but that it was ‘really small’. Jacques immediately wrote back that the parents ‘Blauwe Witpen 294’ x ‘Sproetje 163’ were both a bit small. He promised to ‘re-couple’ them, and what happened: in 1973 the ‘Blauwe Withpen 294’ was paired to the young hen the ‘Blauw 505’ (B71/5251505). And you may have guessed already… the first young that they produced was ‘De Baron’! As I said before, I was very impressed by ‘De Baron’. A calm, intelligent bird. Not very muscular in the hand. Especially beautiful because he always was in radiant condition, in perfect balance, and of course also because he was a champion. And he certainly had an infallible compass. His eyes were of a special white grey colour with a lot of black. I have always thought it a pity that ‘De Baron’ was flying only in races from Quievrain. I don’t want to take anything away from the speed racers, but in my opinion ‘De Baron’ would have been capable of much more then racing just from Quievrain. The only time in his life that he was basketed for a race from Vervins he already proved this by winning the 1st prize with minutes ahead against 389 pigeons. The similarity with the ‘Goede Kleine’ and the ‘Kleine Blauwe Maes’ goes further. The descendants of these distinguished pigeons proved that they were able to triumph even from Dax and Barcelona, and the offspring from ‘De Baron’ equalled that and still do. The first example was his son, the ‘Jonge Baron’ (5090004/76), a phenomenal flyer from Quievrain to Limoges with among others 8th semi-national Chateauroux 1978 against 9,614 p. and 1st interprovincial Chateauroux 1980 against 2,488 p. In between, in 1979 he still finished 125th national against 9,473 p. from Limoges. – B88/6634195, F. + H. Moris, O.L.V. 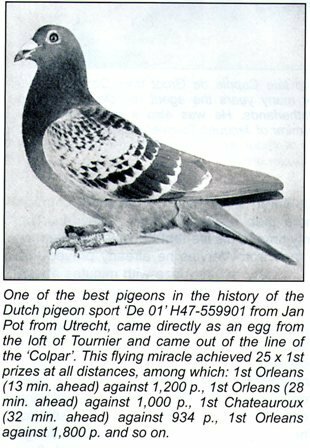 Waver (Belgium): 1st national Bourges 7,750 yearlings in 1990 (fastest of all 25,723 pigeons!). – B86/5090225, J. Hermans, Waalre (Holland): 1st national Orleans R. IV and car-winner long-distance club Zuiderkempen against 18,897 pigeons. – NL91/4161903, Brothers van Sambeeck, Eersel (Holland): 1st international Marseille hens 1993. Countless fanciers over the whole world were successful with descendants of or relations of ‘De Baron’. To name some of them: Joop Biezemans from Vlijmen; Piet v.d. Merwe from Dordrecht; Jaap de Graaf from Spakenburg; A. v.d. Plas from Rijkevorsel (1st prov. 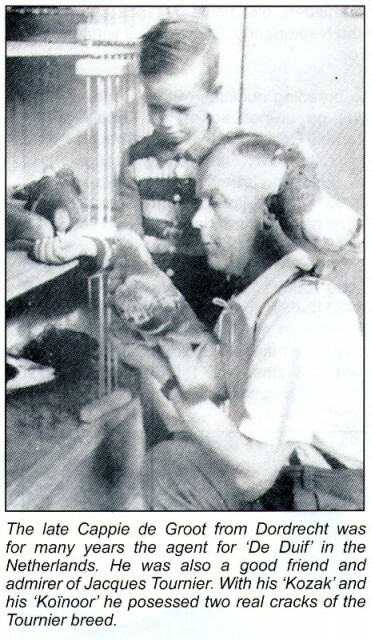 La Souterraine with ‘Boemerang’ out of the line of ‘De Baron’); Frans Weckhuyzen from Aarschot (his basic breeder ‘De Witpen Limoges’ was closely related to ‘De Baron’ by way of v. Goolen) and through his sale among others Eric Limbourg. – NL84/8401417, ‘Turbo Bergerac’: 3rd nat. Bergerac against 22,510 p. + car. – NL86/8687803, ‘Goede Blauwe 03’: 6th nat. Perpignan against 3,242 p., 27th nat Perpignan against 2,975 p., 30th nat. St. Vincent against 26,716 p.
The American Dr. Alfred Piaget from New Jersey is very successful with the Baron breed. And v.d. 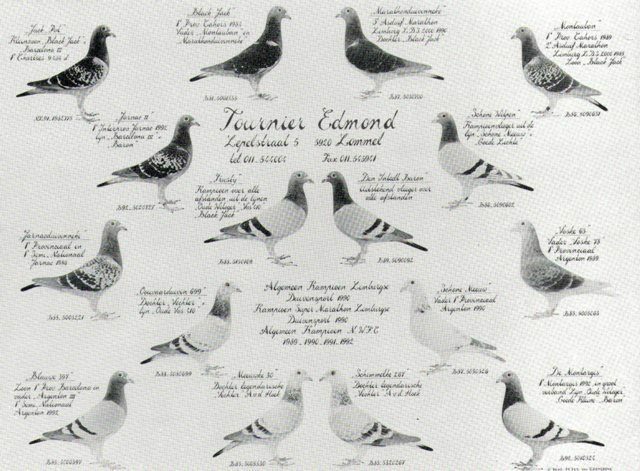 Wegen bought a couple of Tournier pigeons at a sale in Dordrecht at the end of the 1970s, among which a direct son of the ‘De Baron’. I don’t know if he had any success with this bird, but years later I still noticed it in the loft. And what do you think of the (former) speed-canon Rudy Smits from Biddinghuizen? He bought a daughter of the ‘Jonge Baron’ in 1977 and called her ‘Barones’ (B77/533688). Offspring of this golden breeding hen made him the best speed racer of Holland. His ‘Blauwe’ 835/85 was really outstanding with: 1st Roye against 4,213 p., 1st Heverlee against 3,268 p., 1st Strombeek against 1,786 p., 1st Epernay against 972 p., and so on.